Most pupils walk to school. We strongly encourage the use of footpaths and underpasses but, if pupils must cross the road, they should use the pedestrian crossings on General Booth Road. 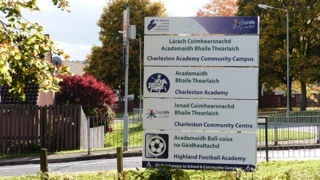 Pupils living outside Inverness travel to and from school by bus. Our Stewards and senior staff supervise pupils disembarking and boarding buses at the bus turning circle each day. Senior pupils on each bus route act as “Bus Monitors”. They ensure pupils wear seat-belts, are respectful and well-behaved. They will report any misdemeanours to the Senior Management Team immediately if there is an incident in the morning and by phone or at the start of the next day if their is an incident on the journey home. As safety on school buses is paramount any pupil misbehaving on school transport will be severely dealt with. This can, in serious situations, result in a bus ban for a period of time or indefinitely. In such circumstances parents will then have to make their own arrangements to transport their child to school. All bus pupils will be issued with an application form for a bus pass and passes will be issued shortly after the beginning of each session. Bus passes should be carried at all times. If pupils miss their bus home, they should go to the school office immediately, where arrangements can be made to get them home safely. Pupils must not set out to find their own way home. The school car park must not be used as a drop off point for pupils. 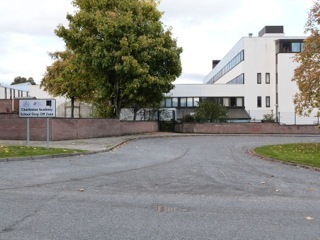 As over 120 staff work on our school campus, our car-park is extremely busy between 8:30am & 9:00am and after 3:30pm. Only parents who are required to come into school or are attending a meeting should park in the car-park. 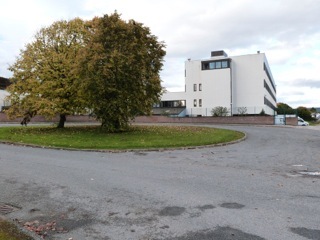 Parents should instead use the Turning Circle and designated Drop Off Zone on Charleston View. Pupils should not stand alone in the car park or at the roadside in the evenings waiting for parents. Parents collecting pupils at 3:30pm should park behind the buses in the bus turning circle or at the car park at Charleston Shops. We encourage cycling to school if it is safe to do so. We work with Velocity to promote safe routes and responsible cycling to school. At the start of S1 each session pupils will be invited to take-part in a serious of workshops, skills sessions, and safety lessons in order to promote safer cycling to school. Velocity also support us in running longer cycle trips to promote cycling confidence amongst pupils. Two secure bike sheds are available at the front of the school, one for staff and one for pupils. These are locked during the school day but pupils must ensure their own bike is locked up inside too.